Very deep and interesting read, maybe a bit much (for me!) at some points but truly a treasure! I'm always up for a good book recommendation. Looks really interesting. Ah, I didn't realise this was out... great!! 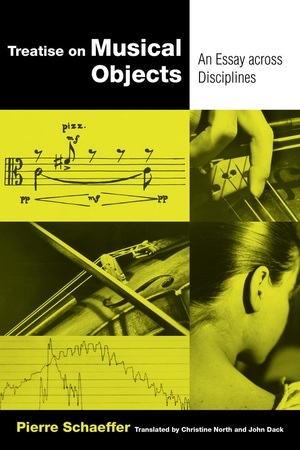 Having read In Search of a Concrete Music and really appreciating the significance of Pierre Schaeffer's work, Treatise on Musical Objects is sitting in front of me. Another good book is “Listening Through the Noise: The Aesthetics of Experimental Electronic Music” by Joanna Demers. She writes quite a bit about Shaeffer’s theories particularly those relating to “reduced listening”. Dack's translation took quite some time, and then he had difficulties finding a publisher, so I'm happy it's finally out. I think there is also a (poor) Spanish translation, but for years everybody seemed to think, this stuff is just too difficult to render in English! I read the French original many years ago and always recommend it (or the translation). Michel Chion's Guide des objets sonores (also available in English, I think) and the Solfège des objets sonores with its sound examples are other useful sources.